On the heels of the warmest 12-month period in Australia’s recorded history, parts of the country experienced an unusually strong stretch of warm autumn weather in May. Global warming has aided the string of record-breaking temperatures, according to Australia’s Bureau of Meteorology (BOM) and other scientists, and will continue to increase the odds that new records will be set in the future. 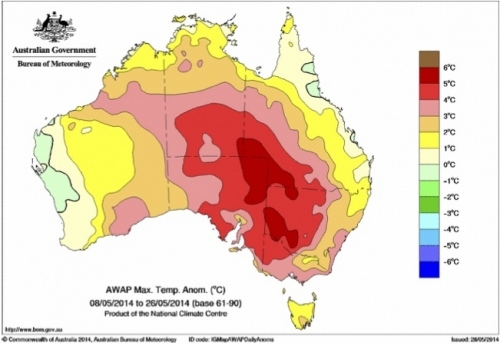 Maximum temperature anomalies (compared to 1961–1990 average) across Australia from May 8 to 26, 2014. “If you want to look for effects of climate change, Australia is the poster child in many respects,” said Kevin Trenberth, a climate researcher at the U.S. National Center for Atmospheric Research. Australia has certainly been much in the news for extreme weather events in recent years, especially for relentless heat waves during the past two summers. And 2013 was the hottest year on record for the country, handily beating 2005, the previous record holder, by 0.3°F. So far, 2014 ranks as the fifth warmest on record. More notably, with each month this year, the running 12-month temperature average has set a new record for warmest ever. Official records are only in through April, but “it is virtually certain that the 12 months ending May 2014 will also set a new high record,” the BOM said in a Special Climate Statement following an unusually warm spell in May, which mainly affected southeastern Australia and Tasmania. May typically sees temperatures fall by several degrees in Australia as the Southern Hemisphere transitions from fall to winter. But from May 12 onwards, a high-pressure system parked itself over the Tasman Sea, refusing to budge until May 27, the BOM statement said. This atmospheric arrangement brought winds down from the north and northwest, sweeping in warm air from over northern Australia and the Indian Ocean and bathing the southeastern part of the country in temperatures up to 11°F above normal. While warm spells aren’t unusual for this time of year, and this particular one only set a few absolute temperature records, it lasted far longer than past events. For example, Sydney had 19 days above 71°F from May 10-28, far more than the previous record of 9 days, which was set in 1978 and tied in 2007. And while it is tricky to link this particular warm spell, like any single weather event, to climate change, the warming of the planet is playing an important background role in Australia’s temperature records, both scientists with the BOM and other organizations said. “With the continuing plague of abnormally high temperatures across the continent, the influence of climate change can be felt now,” Australian non-profit Climate Council said in a report on the recent warm spell. Australia’s average temperature has warmed by 1.6°F since 1910, in line with estimates of the rise in global average temperature, according to the BOM. So any heat wave rolling through is getting a boost from higher baseline temperatures. “As the mean becomes warmer it become easier to break significant climate records,” David Jones, manager of climate monitoring and prediction services for the BOM, told Climate Central in an email. The climate change signal can stand out more in the temperature trends of Australia in part because of its location in the subtropics. In the summer, the jet stream — a key driver of weather variability — moves to the south of the continent, so the trend of rising temperatures with climate change stands out more clearly because there’s less noise obscuring the signal, Trenberth said. So even though there are year-to-year variations in temperatures, “they’re simply getting hotter,” Trenberth told Climate Central. It’s too early to say whether 2014 might catch up to 2013 in terms of record heat, but with an El Niño developing, it’s a possibility. El Niño is a cyclical climate phenomenon that features higher-than-normal sea surface temperatures in the eastern and central tropical Pacific. This anomaly influences weather around the world and “it will tend to raise temperatures even more than the higher-than-normal temperatures expected,” Will Steffen, of the Climate Council and the Australian National University, wrote in an email.